A while back, I had visited Robson Leather and had made some inquiries. As many of you also know, in addition to their wonderful custom leather work, Robson also is known for their carbon fiber work – specifically, their carbon fiber overlay work where they take a stock trim piece, actually shave down the piece a few millimeters, overlay the carbon fiber cloth and then coat with varnish. Actually, over a dozen coats of varnish. The advantage of shaving down the piece, of course, is so that the dimensions of the piece do not change – most manufacturers of true carbon fiber pieces simply overlay without shaving down – resulting in pieces that look “bulky” due to the added, well, bulk. There are other “carbon fiber” pieces out there as well – but these are pieces that are either painted with carbon fiber patterns, or even printed with carbon fiber patterns. 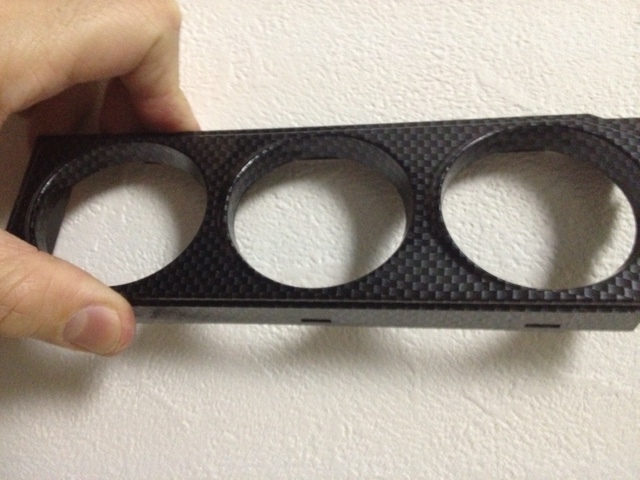 Here is an example of a piece with a printed carbon fiber pattern – yes, the OEM cover for the 3 gauge cluster. And here is an example of a painted carbon fiber trim piece –again the same OEM cover. OF course, the advantage of the painting/printing method is, it allows for pieces with structures and shapes that are not conducive to carbon fiber overlay to be “carbonized.” For example - these gauge cluster covers actually have a small lip on the sides of the holes… and the holes themselves are actually not equal in diameter! There is of course one more type of “carbon fiber” which is known as the “carbon fiber wrap” – that is, using 3M’s DIN-OC product imprinted with a carbon fiber pattern – and I’ve used this too. But in the end, there is no substitute from real carbon fiber. Wet or dry, the real stuff is beautiful if done well. 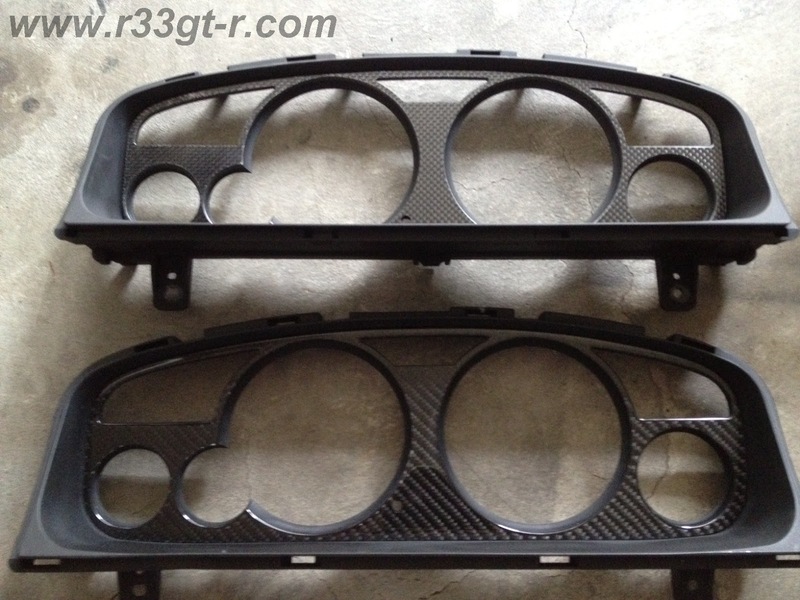 And so – as one of my pet peeves about the R33 GT-R is how cheap some of the interior materials are, I decided to replace the most glaring problems, the imprinted carbon fiber trim. 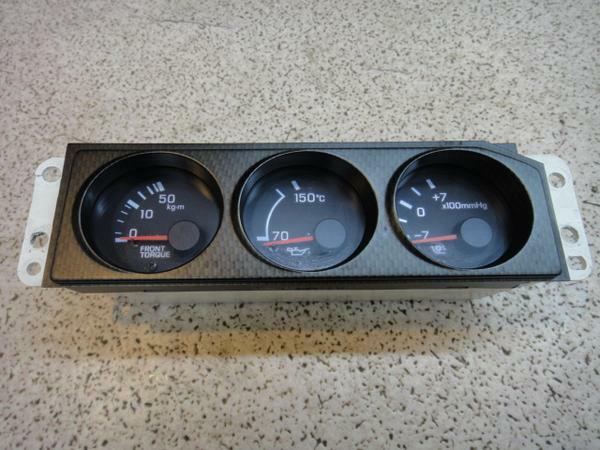 The two pieces that are imprinted are, the plastic trim surrounding the main gauges (tach, speedo, etc.) in the instrument cluster, and yes the aforementioned 3 gauge cluster surround. 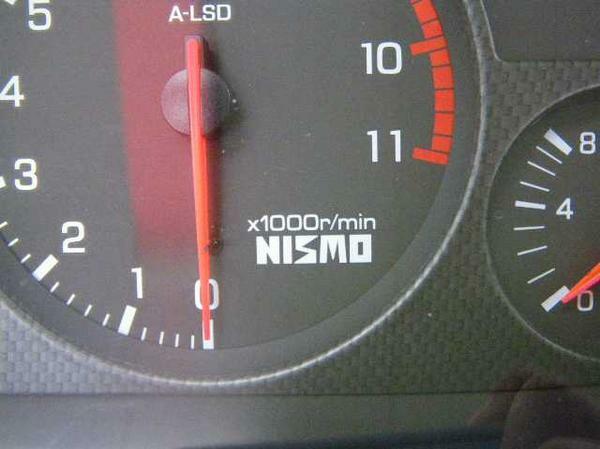 Here is a closeup of the imprint next to the speedo (taken from a close up of a Nismo gauge cluster). This bothered me enough that I found, purchased and applied a thin carbon overlay - but not only did it now mismatch the stock 3 gauge cluster, it looked somewhat cheap. So I was thrilled when the main cluster surround came out beautifully - the top piece is the overlay, and the bottom is the Robson version. 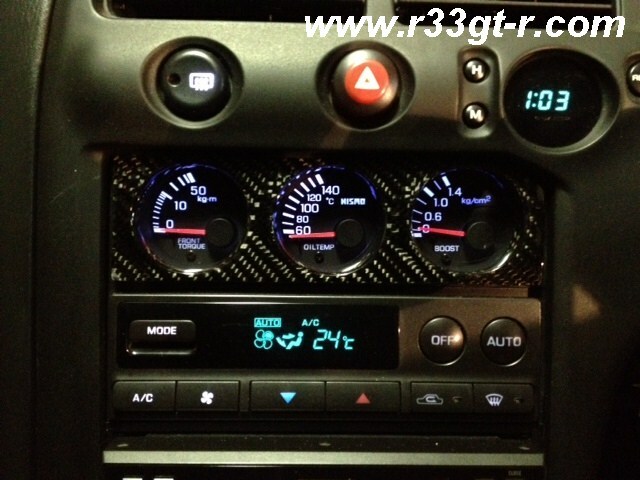 However, the 3 gauge cluster one took some time, because of the difficult shape of the trim piece, as I noted above. But in the end, it came out very nice, and any “flaws” I think can be justified by the hand made nature of the work! BTW - this was the first time EVER that Robson had attempted to carbonize this certain piece! Installation is a straightforward affair – pop out the shift lever surround, unscrew the two screws holding the dashboard piece cover, pop that off being careful to unhook all the wiring, then unscrew the 3 gauge cluster and the main gauges. For the main gauges, gently pop off the clear plastic cover to open up the cluster, then pop off the plastic gauge surround itself (ie the item that got carbonized). For the 3 gauge cluster, the front cover is plastic, so pop that off and replace with the carbonized piece. When done, reverse the above steps. As for how the whole dash looks now - I'll have to show you in an upcoming post, as I've been so busy lately that I haven't seen my car in the daylight, and want to get a good shot of both pieces in the sunlight! Stay tuned! Hmmm, I think the weave is to big and stands out like a sore thumb. Nissan was spot on perfect with their tight weave synthetic lay out. Perhaps... but real carbon is always better than the fake stuff, no? Have him do your Series 3 front lip!! I believe you would be the first to have that..
Other pieces look great Aki. Thanks Kunal but I am not rich! And, my car scrapes enough as it is... but I DO have a project in mind soon, if I can find the time... stay tuned! Would you be able to 'devuldge' how much the sub meter facia was at all? Have been following your blog for quite some time and must say, yourself and your car are an inspiration for my own 33 GTR. Thanks for the kind words! I regret that I haven't had the time to really update it, but hope to do so again in the future as my life calms down. Re your steering wheel - not sure why a late R33 wheel would not work? A late R33 would not be able to use an early R33 wheel, as the required resistor/circuitry for the passenger airbag would not be there on the S1 wheel, but would not the converse allow usage of a S2 wheel on your S1? Thanks the time taken to reply. That is very expensive! If i recall correctly I paid around 120AUD for my main cluster facia (thin piece of cf sheet cutout with double sided tape). I wonder if tracking the maker of that would yield any luck! The s2-3-34 has the airbag computer near our g sensor as you know. Apparently people have made the late models work completely on a s1 without using the later model dash. Bringing up the resistor part has me thinking as that is how you generally bypass airbags etc in some cars! All i need now is a spare s1 wheel and a s2-3/34 wheel and I'll get onto it! Hope you get some free time again soon! Once again, thanks for taking the time to reply!